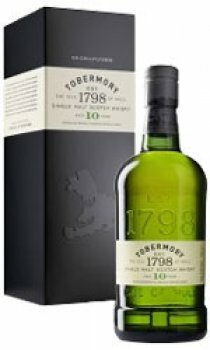 Tobermory 10 year old has evolved with a new look and taste, reinforcing the premium quality and heritage of the brand. By not chillfiltering their whisky, and with a strength of 46.3%, the distillers ensure that you can appreciate the full depth of flavours, aromas and character of this fine malt whisky. It is an ideal strength to dilute to your own taste. You may expect a wonderful cloudy haze when adding water. This is completely natural and with no caramel added you will be tasting whisky as natural as it can be - just as it should be. A world renowned single malt as unique as this deserves to be held in a bottle with real character. The specially selected glass proudly embraces the past; paying homage to the distinctive old green bottle and referencing some of the qualities of the historic Tobermory packaging. The bottle is presented in a quality gift carton.